When should women receive their first mammograms? The widely accepted current guideline says age 50. But that might not be early enough for some ethnic groups, according to new research. 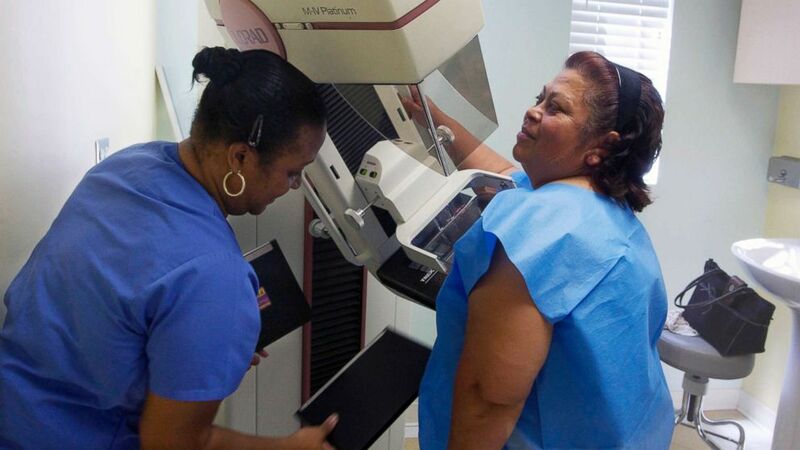 A Harvard-based study published today shows that a higher percentage of Asian, Black and Hispanic women are diagnosed with breast cancer by age 50 than white women. “The situation with breast cancer is one of the best examples of how science done without regard to racial differences can produce guidelines that would be ultimately harmful to minority patients,” lead author Dr. David Chang, an associate professor of Surgery at Harvard Medical School, said in a statement. Researchers looked at a national database of almost 750,000 patients from 1973 to 2010 and more than 30 percent of breast cancer diagnoses in the study for the Asian, Black and Hispanic women, happened before they were 50 — 32.8 percent, 31.0 percent and 34.9 percent, respectively. For white women, the rate of breast cancer found before 50 was 23.6 percent. A technician carries out a routine mammogram in France, Nov. 29, 2016. Breast cancer screening has been the subject of much debate in recent years and the guidelines have changed. A mammogram is the main diagnostic tool, an x-ray that looks for cancerous masses in the breast; it can help find hidden or small cancers too small to feel or normally see. It’s imperfect, but it’s the best safety net yet devised to catch breast cancers early. A national panel of doctors and public health officials, the U.S. Preventive Services Task Force, usually creates general recommendations. But other groups like the American Cancer Society (ACS) have their own recommendations, too. For example, USPSTF recommends biennial mammograms starting at 50, but ACS recommends annual mammograms starting at 45. What do the study researchers recommend? “If the science upon which clinical guidelines are based was not done in a way that respects racial differences, there is little that can be done at the point of delivery to improve patient care,” said Chang, who also practices at the Massachussetts General Hospital Department of Surgery. To create a safety net that provides similar protection for nonwhite patients, this study recommends that Asian and Black women start screening at 47, and that Hispanic women start at 46. They also found that Black and Hispanic women are often diagnosed at later stages of the cancer. Some bigger questions weren’t addressed in this study: would earlier mammograms make these women actually live longer? Would the additional tests be worth the cost in terms of lives saved, or would the same risks of over-testing apply? As medical research adds more data to the discussion — balancing risks, rewards, costs, and new research — a “one size fits all” recommendation on breast cancer screening becomes increasingly difficult. Dr. John Byun is a Radiation Oncology resident based at the Rutgers Cancer Institute of New Jersey and a resident in the ABC News Medical Unit.